I don't really know where to begin with this one. I sat on the fence for weeks after seeing the movie, and even after starting this review; is it worth talking about or not? I tend to stifle strong feelings on subjects of popular media because, really, it just doesn't matter. There is minimal consequence (without getting into the 'culture is a school' thing) and sometimes it comes down to the 'pop is art, even if it's bad art' argument. But I feel very strongly about the subject matter on this one and did not feel such strong abomination against the first film. What's been done here is this: a kind, delightful, "children's" novel has been turned into a non-stop actionfest. The proverbial lamb has been sacrificed upon the altar of entertainment. While Mr. Jackson showed some signs of misunderstanding with a bundle of the choices he made in The Lord of the Rings films (like when he said elves were telepathic), he still attempted to keep things within the realm established by the books, seemingly. The Hobbit throws all of this out of the window in what is seemingly the ravings of the waking dreams of a senile action movie choreographer in the last few minutes of his life. It's one of the few movies in which I actually said aloud, 'Make it stop'. I thought I had feasibly detached my love and strong feelings toward the book from the film version, but I had not. So, when I saw Bilbo lose it and hack a spider to pieces over his Precious, it made me a little bit ill. I understand that they want to hype the power of the Ring in anticipation of LOTR, and Tolkien had no idea what the Ring was when he first wrote The Hobbit, but it doesn't even make internal sense: he'd had the Ring for a day or two. Is the Ring such that it would turn a timid little hobbit into a berserker in that amount of time? I suppose so. These bizarre choices are what stick with me. There were a lot of them in LOTR and even more in Hobbit. For example, if you've got three hours to kill why spend only five minutes on a popular and important character like Beorn? Why cut out the bit where the dwarves interrupt the elves merrymaking? I suppose if what you want is two hours of action and 45 minutes of plot then such sacrifices have to be made. Even if you are taking up the argument that Wingnut, et al, are attempting to bridge the gap left by Tolkien between The Hobbit and Rings, there is no explaining the departure in tone. Even if you say that they are trying to put The Hobbit onto the same level of 'maturity' as the LOTR films, it does nothing to permit the cartoonish and excessive violence. Patrick Rothfuss, over a year ago before the release of Hobbit 1, wrote a blog entry that was rather a bit much but still met my point. In short, he says that Bilbo has been, effectively, prostituted by Hollywood. The tone and nature of the book has been stripped away and cast aside in favor of something that would, presumably, satiate an audience looking for nothing more than a spectacle. I don't like it, but I will probably still see the third film and regret it. Amen. "Departure in tone" is the perfect way to describe my issues with the movie. What he said in spades. I used to give the Tolkien estate a lot of grief for their disavowal of the films, but I'm starting to see the point. In any case, it must all be about money; I've heard people say "at least there weren't any songs in [Hobbit 2]". So, really, many aren't looking for a faithful translation of the book. They just want fantasy action. And, so, who can blame the film companies for wanting to make a buck? I totally understand and appreciate you opinion, and all those who have similar criticisms, even as I disagree. I toyed with the idea of doing a movie review, but felt like I would spend the whole time defending the movie, which wouldn't be very valuable for anyone. I do think the insinuations that the changes were all about money and profit-making are totally overblown though. 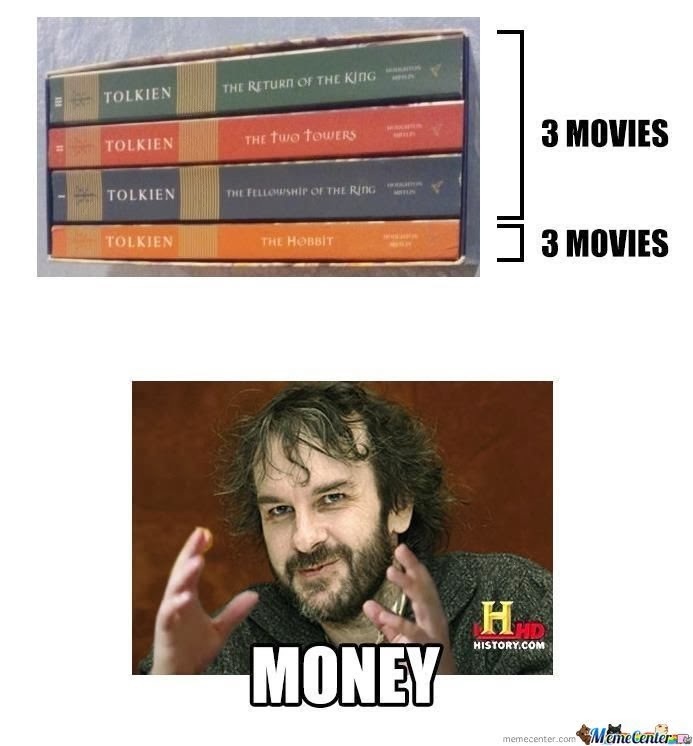 While money has some influence on all movie making, I think the Hobbit we see is more a result of who Jackson is as a director than crass pandering. He's all about spectacle, action, and immature/crude humor, and that's what we get. I just find that this retelling has some intriguing elements. I could see that, Ian. Thinking about King Kong, he was going to sell a bundle no matter which way he took it and he made a seriously long movie full of absurd action, just like The Hobbit. Maybe my beef, then, is not with the perceived abuse of the source material, but with the kind of films Jackson likes to make.